Palestinian Authority Chairman Mahmoud Abbas' adviser slammed US Ambassador to Israel David Friedman for "encouraging religious terror," Israel's Reshet 13 reported. The accusation follows the publication of a photo of Friedman receiving a photo of the Temple Mount without Al Aqsa Mosque in the background. According to Abbas' adviser, Friedman "has turned into the spiritual father of racism." "The ambassador to the occupation has become the extremist father of extremism and racism," he said. "This is outrageous incitement by a diplomat who is biased and extremist, and issues clear calls to religious terror. This is a dangerous precedent which aims to incite disagreements." 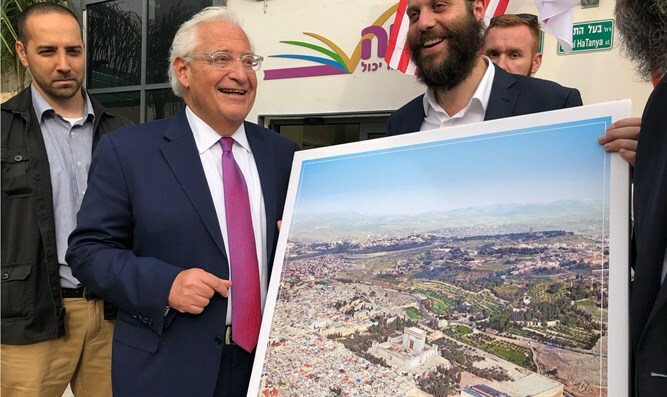 The picture, which was a real photograph of the modern Old City of Jerusalem and the Temple Mount with the Holy Temple digitally imposed over the Dome of the Rock, was presented to Ambassador Friedman by the "Achiya" organization during a tour in Bnei Brak. The publication of the picture on the haredi news site Kikar Hashabbat aroused outrage among left-wing activists on social networks, despite the fact that the picture was thrust on him without his knowledge. In a statement, the US Embassy said, "Ambassador Friedman was not aware of the image thrust in front of him when the photo was taken. He was deeply disappointed that anyone would take advantage of his visit to Bnei Brak to create controversy. ‎The US policy is absolutely clear: we support the status quo on the Haram al-Sharif/Temple Mount."